When the leaves begin to change colors and the air gets a bit nippier, over the sounds of the rejoicing that it is no longer bathing suit season, I hear the call of a hot pot of chili. Chili is a go-to fall meal in our house, with it’s rich tomato base, flavorful ground beef, and protein packed kidney beans. It works after a weekend of raking leaves or after a brisk walk through the pumpkin patch. It’s delicious after a prosperous night of trick or treating, or as a day before Thanksgiving meal – hearty, warm, and delicious without taking up too much of the room you’ll need for turkey. I am not a fan of spicy foods, and normally, chili would not be a dish I would ever order out. But my mom put together this recipe – the one she’s been using since we were all little – and it really is the perfect kid-friendly chili. 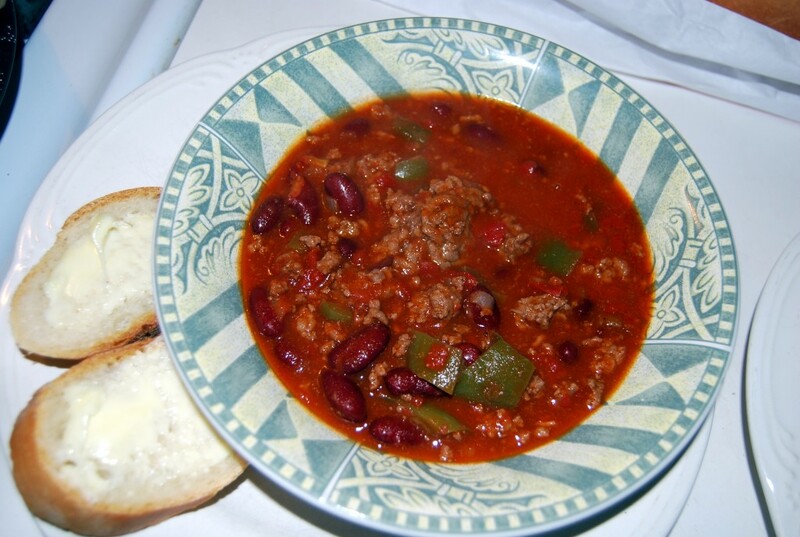 You don’t have to worry about too much spice – the chili powder in this rendition of a classic favorite is really used just to enhance flavor, not spice things up. Kids won’t burn their tiny tongues eating this version, and even further, if you’ve had gastric bypass surgery and are only recently treading the waters of solid food, this won’t irritate your stomach with the bite of hot peppers. This recipe easily feeds 6 people, especially with a crusty roll. Add a salad, and you could probably get 8 bowls. Fry meat, onions, and peppers in a large skillet. Add salt and pepper to taste. Drain all fat off when finished. In a large pot, mix all other ingredients. Heat until meat is finished frying. Season with chili powder (the amount above will make the chili mildly flavored, so add more if you like to spice it up a bit). 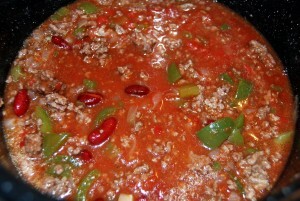 When meat is finished cooking, add it to the large pot. Simmer on low heat for one hour covered and then one hour uncovered.